European exploration of the Outer Banks of modern-day North Carolina began in the early decades of the sixteenth century. The Florentine Giovanni da Verrazzano in the service of the French king, Francis I, skirted the Outer Banks in 1524 and the following year the Spaniard Pedro de Quejo passed by on a voyage to the Chesapeake Bay. Neither the French nor Spanish made any effort to settle the region, however, and other than a brief visit by the Spanish in 1566 Europeans showed no interest in the Outer Banks until the Roanoke voyages sponsored by Sir Walter Raleigh nearly twenty years later. 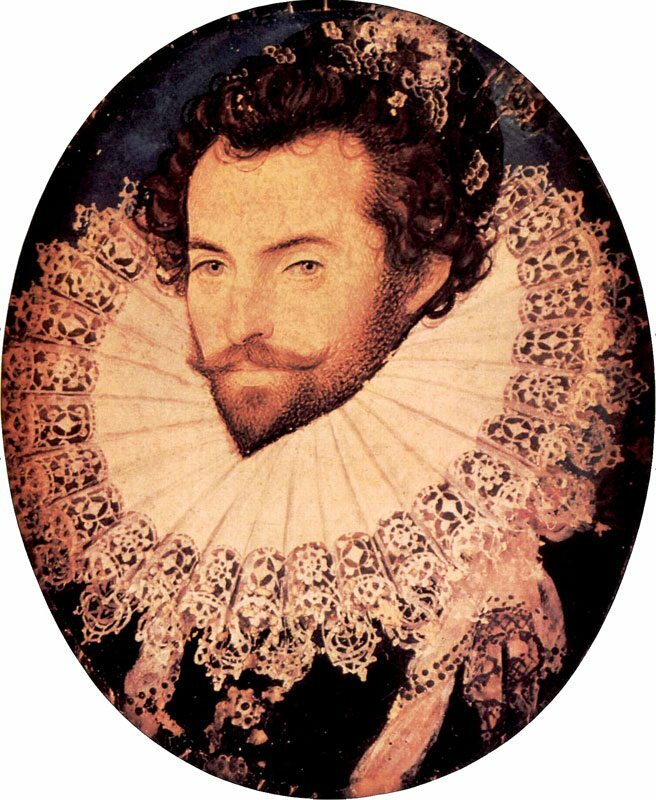 “Portrait of Sir Walter Raleigh, Oval” by Nicholas Hilliard. c. 1585. National Portrait Gallery, London. In 1584, Raleigh, an enormously wealthy courtier and favorite of Elizabeth I, sought the queen’s permission to establish a colony in North America. Letters patent, the legal instrument for the venture, were issued in the spring and permitted him to “discover search find out and view such remote heathen and barbarous lands Countries and territories not actually possessed of any Christian Prince and inhabited by Christian people” and to “hold occupy and enjoy . . . forever all the soil of all such lands Countries and territories so to be discovered or possessed . . . ” In effect, he was given exclusive rights to possess and exploit the resources of the whole of the continent under the sovereign authority of the crown, excluding only those parts already inhabited by Christians, that is, other Europeans. Raleigh’s aim was to establish a colony so as to stake England’s claim to the largely unknown (to Europeans) landmass of North America and from which he could launch raids on the Spanish West Indies and annual treasure fleets. In late April 1584, he dispatched two small ships commanded by Philip Amadas and Arthur Barlowe on a reconnaissance expedition that arrived off the Outer Banks a few months later. Entering into the shallow waters of the Sounds (Pamlico Albemarle, and Currituck), they discovered numerous fertile islands covered with valuable timber and teeming with game. Local Indians were described as a “very handsome, and goodly people, and in their behavior as mannerly, and civil, as any of Europe.” One island in particular might turn out to be a suitable location for the first English colony: Roanoke, ten miles long and two and a half wide, which was inhabited by peaceful Indians who would be their friends and allies. Map of the E coast of N America from Chesapeake bay to Cape Lookout; with royal arms, English vessels, Indian canoes by John White. 1585-1593. Image courtesy of the British Museum. On his return to England in the fall Barlowe wrote an enthusiastic account of Wingandacon,” as the English initially called coastal North Carolina. Besides information gathered by the English during their own explorations, two Indians, Manteo and Wanchese, brought back to England provided valuable reports about the peoples of the region and settlements inland, including a large city to the west called “Schycoake” and rumors of gold as well as a passage to the South Sea that lay at the head of a large river called “Occam.” Raleigh was delighted with the outcome of the voyage and began planning a full scale expedition to plant a colony on Roanoke Island the following year. In April 1585, Raleigh fitted out a fleet of five ships and two pinnaces carrying approximately 600 soldiers and seamen under the command of Sir Richard Grenville, his cousin. After a difficult crossing during which the fleet had been scattered for much of the voyage, the expedition arrived off the Outer Banks in June and began exploring lands along Pamlico Sound. A couple of months later, Grenville moved the fleet to a mooring off Hatorask Island and sent Ralph Lane, a veteran of the wars in Ireland, to establish a fort and settlement on Roanoke Island. Grenville and the fleet departed shortly after to return to England for additional settlers and supplies leaving behind a garrison of 108 men under Lane’s command. In the winter and spring of 1585-86, Lane sent out two exploratory parties to the north and west. The first expedition discovered the mouth of the Chesapeake Bay and made contact with Indian peoples along the southern shore of the Bay. The second, in the spring, explored the Chowan and Roanoke Rivers, during which the English picked up stories from Indians of copper (possibly gold) mines far inland. By this time, Lane had concluded that the colony should be relocated to the Chesapeake Bay where deep-water rivers would make better harbors for English shipping than the treacherous waters of the Outer Banks, and from which colonists could mount further expeditions into the interior of North Carolina to find the Indian mines that had eluded him. Lane was forced to abandon Roanoke Island in late June 1586 owing to hostilities between the English and the Secotans on whom Lane’s men depended for food. He arranged with Sir Francis Drake, who had arrived off Hatorask Island with a large fleet from the West Indies earlier in the month, to transport the colonists to the Chesapeake Bay but a hurricane hit the coast as the men were about to embark and persuaded Lane to return to England instead. Back in London, he reported his discoveries to Raleigh and emphasized the advantages of the Chesapeake Bay as a location for a settlement from which to fit out explorations inland to search for gold mines and a passage to the South Sea. Determined to make another attempt, Raleigh sponsored a final expedition and placed in command John White, who had been on the two previous voyages. “The manner of their attire and painting them selves when they goe to their generall huntings or at theire Solemne feasts” by John White. 1585-1593. Image courtesy of the British Museum. In April 1587, White led a group of 118 men, women, and children, including his daughter Eleanor, and son-in-law, Ananias Dare, besides many friends and associates to establish a settlement on the Chesapeake Bay called the City of Raleigh. They never reached their destination, however. The mariners responsible for transporting them, led by the master pilot, Simon Fernandes, put the settlers off at Roanoke Island instead and refused to take them any farther. After remaining on the Island for six weeks, White returned to England with Fernandes at the end of August for supplies and reinforcements. He was unable to get back to Roanoke Island for three years by which time the colonists had disappeared, leaving behind only a cryptic message, “CRO” and “Croatoan” that told him they had moved to Croatoan Island 50 miles to the south, where Manteo’s people lived. Whilst trying to reach them a fierce storm drove his ship out to sea and the attempt was abandoned. White returned to England and then moved to Munster in southern Ireland, where he likely died in the early years of the seventeenth century. What happened to the colonists remains a mystery. 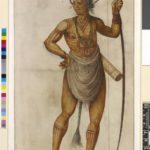 Standard historical accounts argue that a small group removed to Croatoan Island probably in late 1587 or early 1588, while the main group went to live with the Chesapeake Indians on the southern shore of the Chesapeake Bay, possibly near the Lynnhaven River or Elizabeth River. Other research has provided a different theory, whereby the main group moved due west up the Albemarle Sound to the lands of the Chowanocs. Some might have eventually moved farther west up the Roanoke River and joined Tuscarora peoples. Whether on the southern shore of the Chesapeake Bay or in North Carolina, it is generally believed that many of the colonists and their descendants were killed by a large raiding party of Powhatan warriors sent in the spring of 1607 by the Powhatan paramount chief, Wahunsonacock (father of Pocahontas), to destroy the colonists and their Indian allies. Wahunsonacock apparently feared the possibility that the Jamestown settlers, who arrived in the Chesapeake Bay in late April, might develop contacts with the Roanoke settlers and peoples they lived with and thereby threaten his chiefdom. A few of the Roanoke colonists survived the attack, however, and fled up the Chowan River or found refuge with the Tuscarora people at a place called Ocanahowan on the Roanoke River, and to the south, possibly on the Tar River, at a town named Pakerackanick. Descendants of the small group of settlers who went to live on Croatoan Island also survived. Paul E. Hoffman, Spain and the Roanoke Voyages (Raleigh, N.C., 1987). Paul E. Hoffman, A New Andulucia and a Way to the Orient: The American Southeast during the Sixteenth Century (Baton Rouge, La., 1990). James Horn, A Kingdom Strange: The Brief and Tragic History of the Lost Colony of Roanoke (New York, 2010). Karen Ordahl Kupperman, Roanoke: The Abandoned Colony 2nd ed. (Lanham, Md., 2007). David Beers Quinn, Set Fair for Roanoke: Voyages and Colonies, 1584-1606 (Chapel Hill, N.C., 1985). David Beers Quinn, ed., The Roanoke Voyages, 1584-1590 2 vols., (London: Hakluyt Society 2nd ser., nos. 104-105, 1955).